I was recently asked to make Razor’s Hat from the Doctor Who episode World Enough and Time. I wrote up a pattern just in case anyone else was interested in making one for themself! 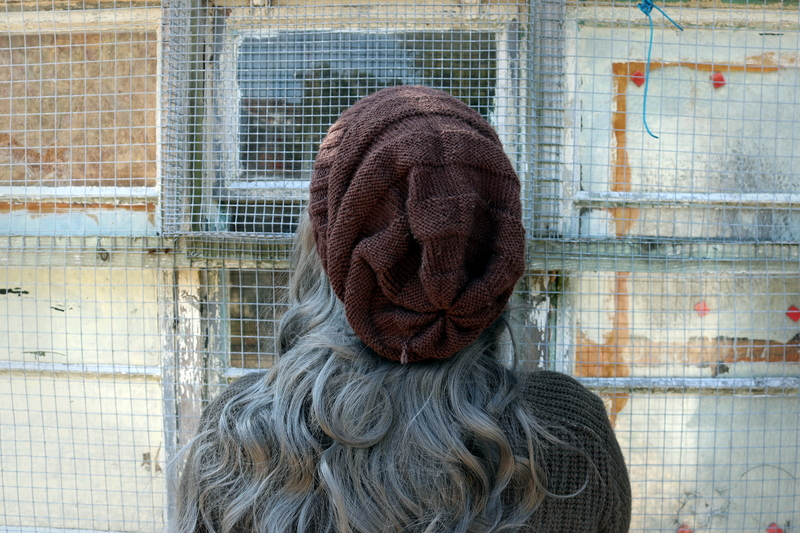 I found that if you want to make your hat distressed in a similar way to the show, it is easier to prevent unraveling if you create the distressing as you go. 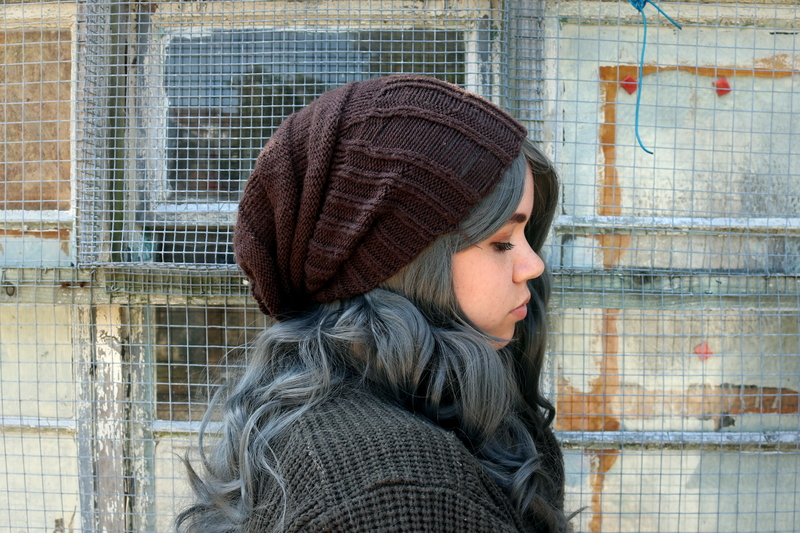 I’ve included two versions of the hat, one with distressing and one without. The hat sits very different just from folding the brim! After working the last row, pull a piece of yarn through and pull as tight as possible. 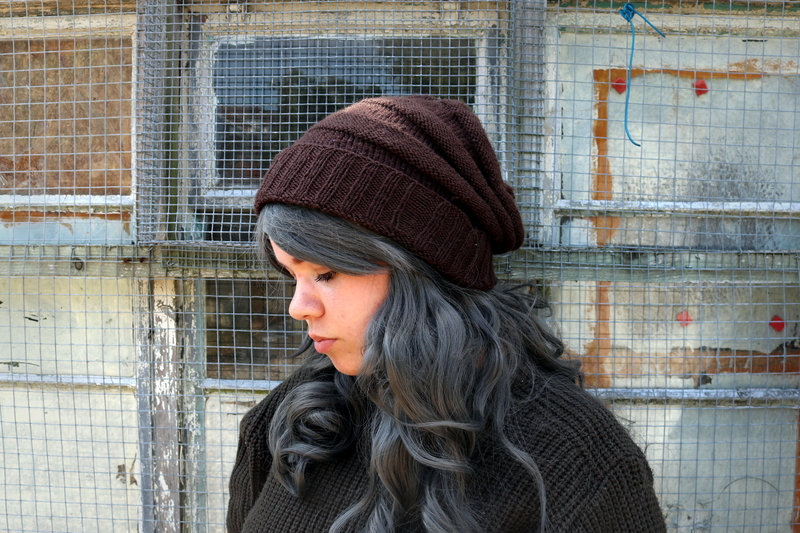 Weave in your ends and your hat is complete! These socks were super fun to make, so I wrote up the pattern and made a video tutorial! Let me know what you think, and be sure to let me know if you make a pair! Adjust stitches so that you can continue working with your Light Blue yarn where you left off. Complete that row in knit stitch, and then do two more rows of knit stitch in Light Blue. Repeat from * until your sock is the right length for your foot. For reference, I had a total of 5 Dark Blue and 5 Light Blue stripes for my UK size 5 feet. Refer back to the heel instructions and work the toe the same as the heel. Complete the sock with kitchener stitch and weave in your ends. Tada! You now have your own pair of 13th Doctor Socks! When I first saw this lovely brown yarn, I knew immediately that I wanted to make some sort of glove or mitten for myself from them. My aunt got the yarn from a place called Pacesetter Alpacas in Beloit, Wisconsin. It’s a wonderfully soft yarn, and I actually got to meet the alpaca from which the wool was collected! I unfortunately lost the label for this yarn, but if I remember correctly, it was a blend of two different kinds of alpacas. Because this yarn was so nice, I wanted to pick the perfect pattern. After much searching, I settled on the Homeward Bound Mitts. The cables on the backs of these mittens caught my eye immediately. I hadn’t knit anything with particularly complicated cables before and this looked like a good way to challenge myself. 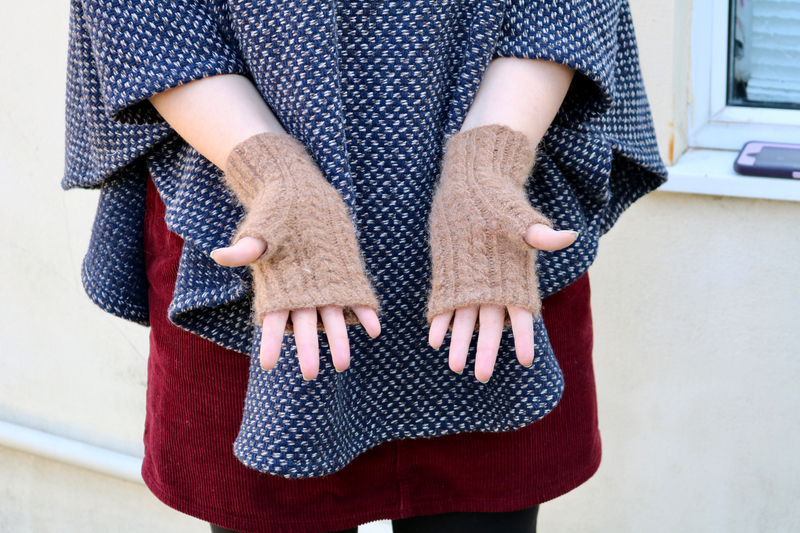 I made these mittens for myself in size 1 using 3.25 mm/US size 3/UK size 10 DPNs. Because I wasn’t planning on switching needles between the wrist and hand of the glove I chose a size between the two recommended in the pattern. 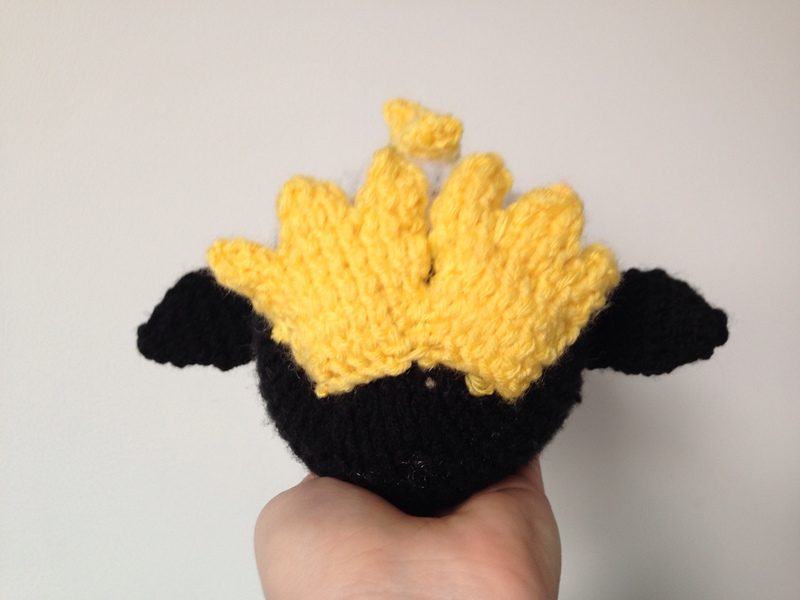 I was a little concerned that they wouldn’t fit properly, but it turned out fine By mistake, I left off the rib on the bottom of the mittens, but I don’t think it’s too noticeable. 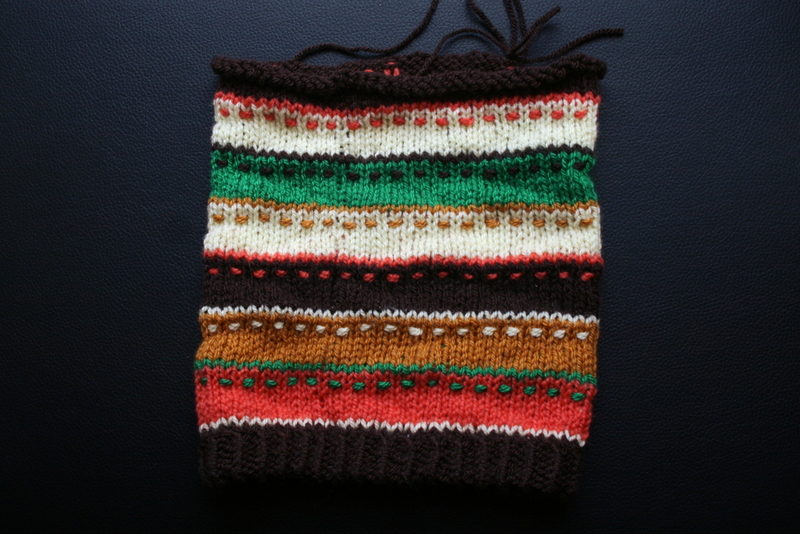 The pattern for these mittens was really well written, and included charts for all the cabling sections. I had never made a thumb before, and this pattern described how to knit one well enough that I made almost no mistakes! 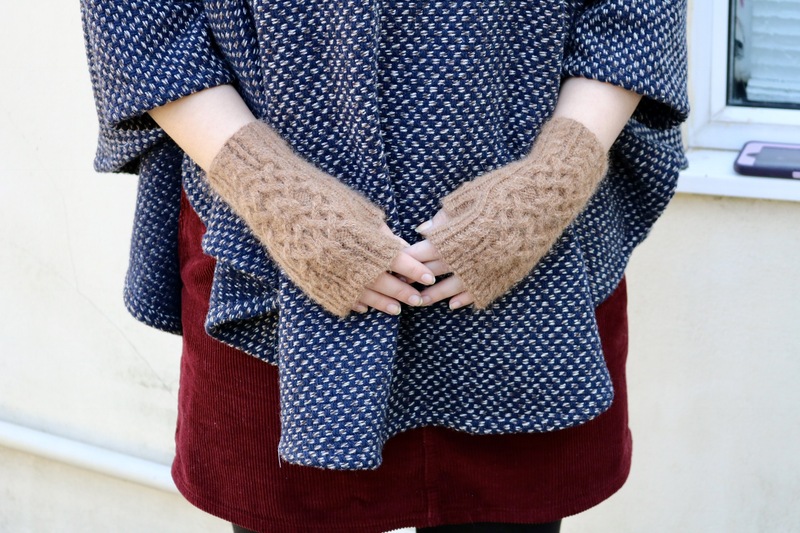 I love these mittens, and I’m almost tempted to make myself a pair in every color. On the second day of London MCM, I wore a cosplay of Nardole from the Doctor Who episode Eaters of Light. I’m starting with the second day because I neglected to get pictures of the costume I wore the first day, but hopefully I’ll get some soon. 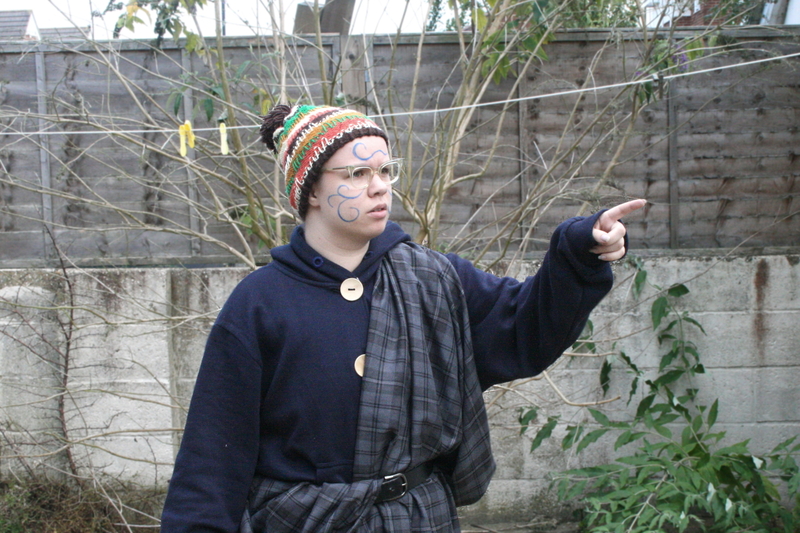 The Nardole costume consisted of a hand knit hat, a sweatshirt, pajama pants, and a kilt. The kilt was simply a huge piece of fabric with serged edges. 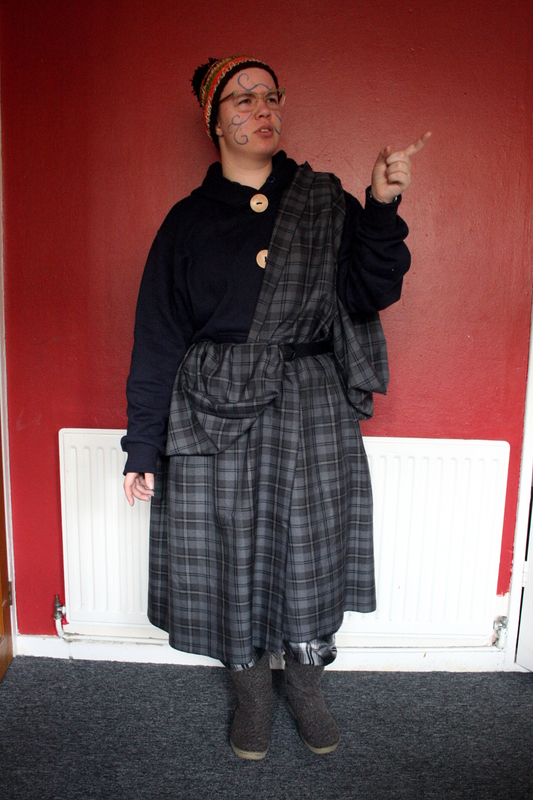 Unlike how the kilt is worn in the show, I wore mine the same way that one would wear a great kilt. Since the sweatshirt was fairly simple in design, I opted to modify a blue zip up sweatshirt I already had instead of making one from scratch. I started by taking out the zipper and the hoodie cord. 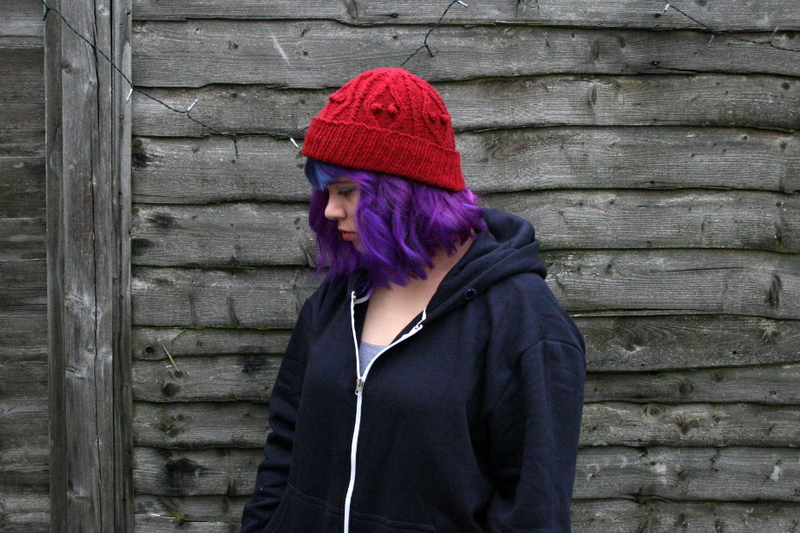 Then, I added buttonholes and large wooden buttons down the front of the hoodie. Even though I’d taken out the bright white hoodie cord, the eyelets in the hood were still visible in bright silver, so I buttonhole stitched all the way around them. 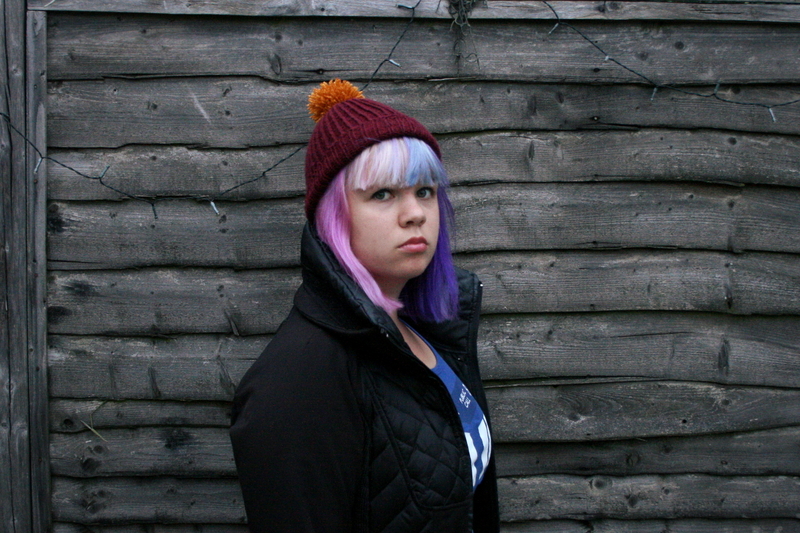 The hat I wore is one I’ve already posted about, and have actually written up a pattern for, so be sure to check that out! This is, by far, one of the most comfortable cosplays I have ever worn. I basically got to walk around in pajamas all day, it was great! 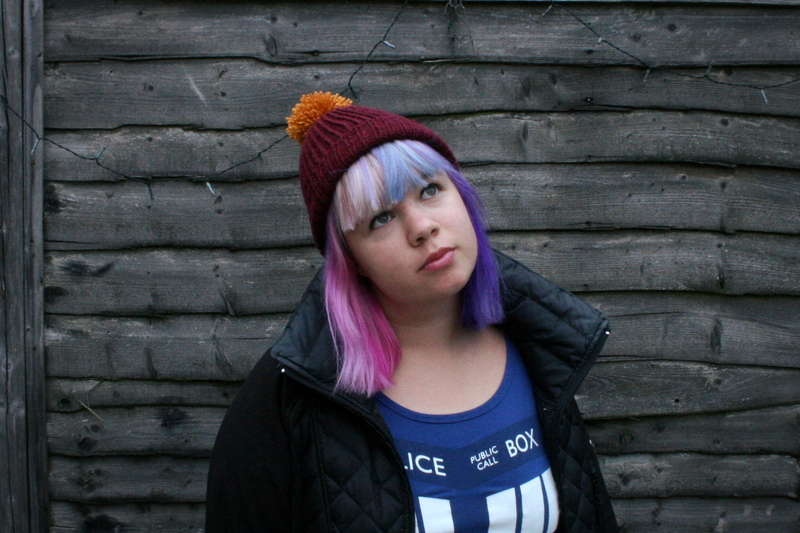 After knitting two of Nardole’s hats, I felt as though I needed more hats. Why? I don’t know, I can’t possibly find the time to wear them all if I keep making them at this speed! 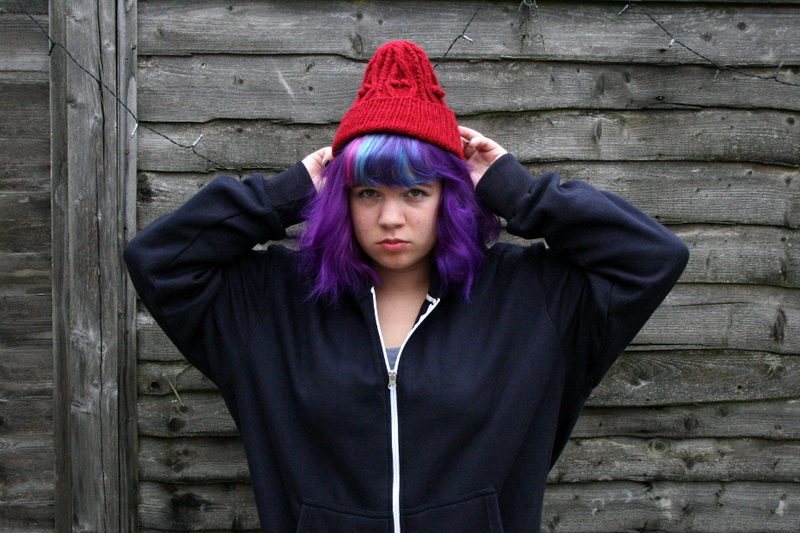 This hat is Wilf’s hat from the Doctor Who episode The End of Time. I remember when I first watched the episode I noticed the hat, but I didn’t think I’d end up making it because it looked so complex. 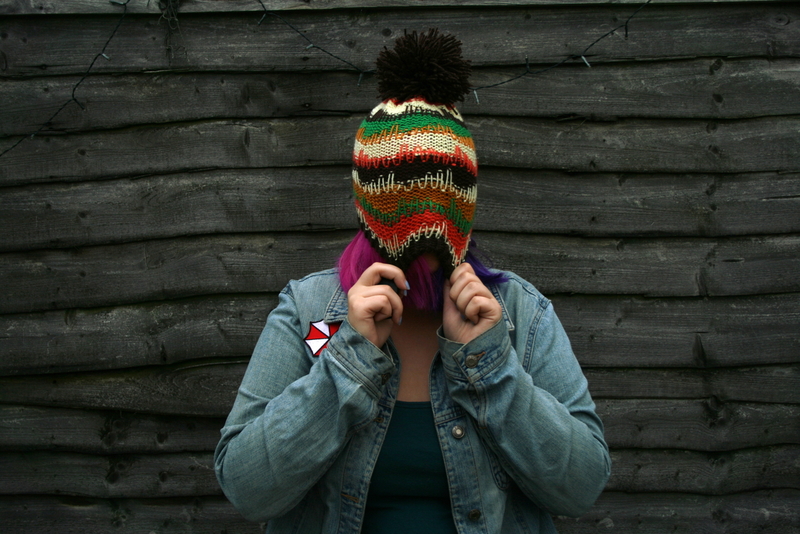 Fast forward to a few months later, and I’ve knitted up the hat! 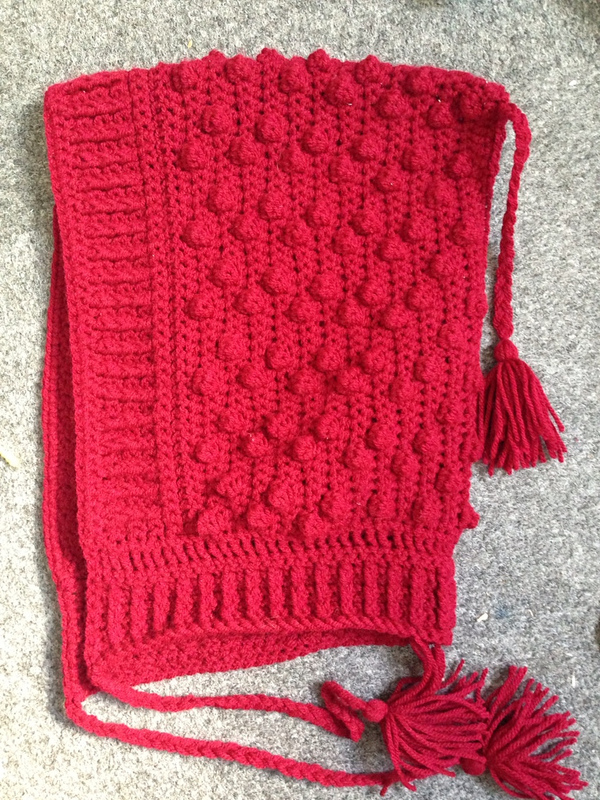 I found a this lovely pattern by Patricia Schönhold on Ravelry. It was my first time knitting from a chart, as well as my first time knitting bobbles. The pattern was easy to understand, and I had no problems with any of it. 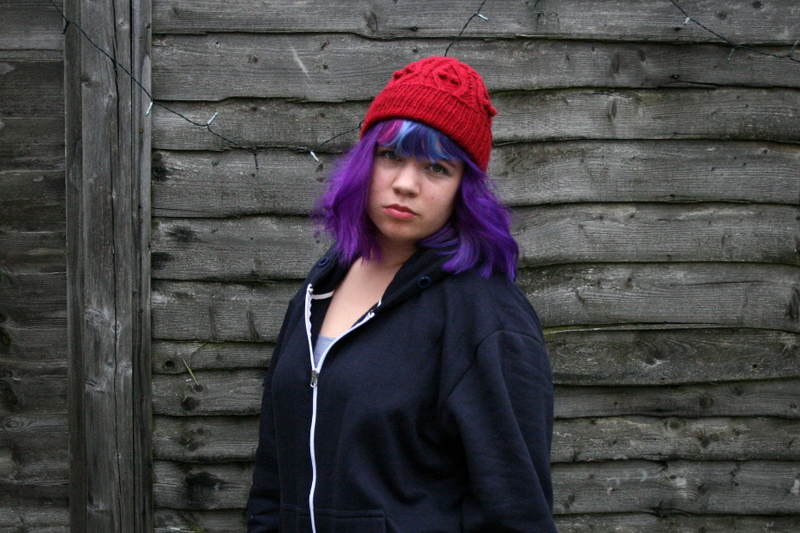 I knitted this hat up with Stylecraft Special DK in Lipstick (this might be wrong, I’ve lost the label) with size 8 (5.0 mm) knitting needles. I realize I’ve used Stylecraft in most of my recent projects. That’s because Stylecraft is really easy for me to get and it comes in a huge number of colors. I did end up changing the pattern just a bit. Near the crown of the head, I added two extra twists in the large cables. Because of this, the number of stitches I had on my needles did not match up with the pattern and I ended up decreasing differently. I don’t remember exactly what I did, but the difference is visible. 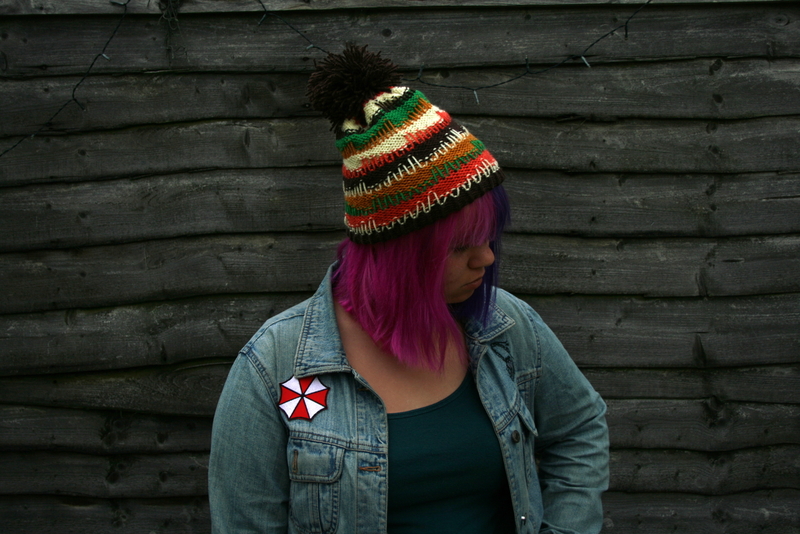 I’m very happy with Wilf’s hat, and I definitely wouldn’t have been able to make it without the pattern I found. 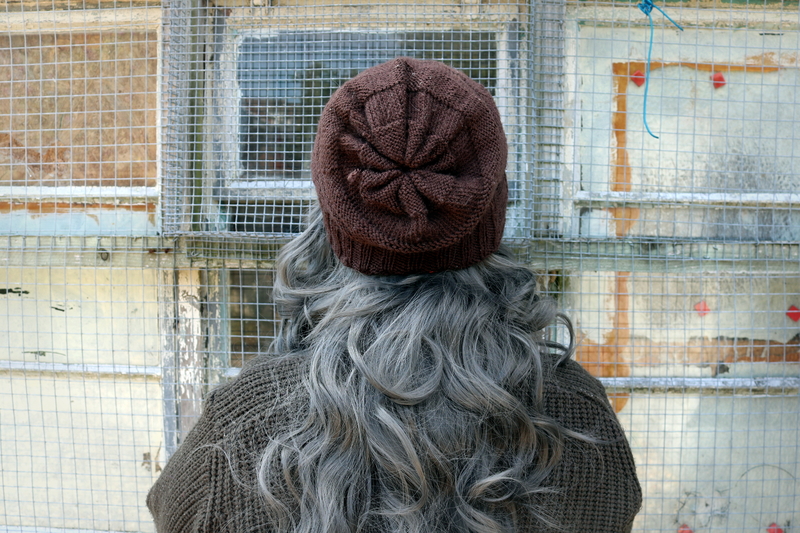 I am glad that Patricia Schönhold put this pattern up, and I would recommend it to anyone else looking to make Wilf’s hat. That’s right! 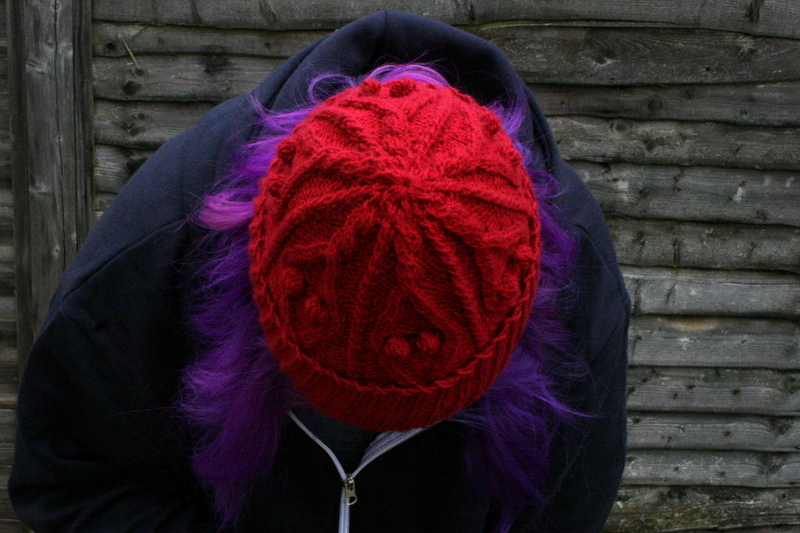 I made another one of Nardole’s hats! 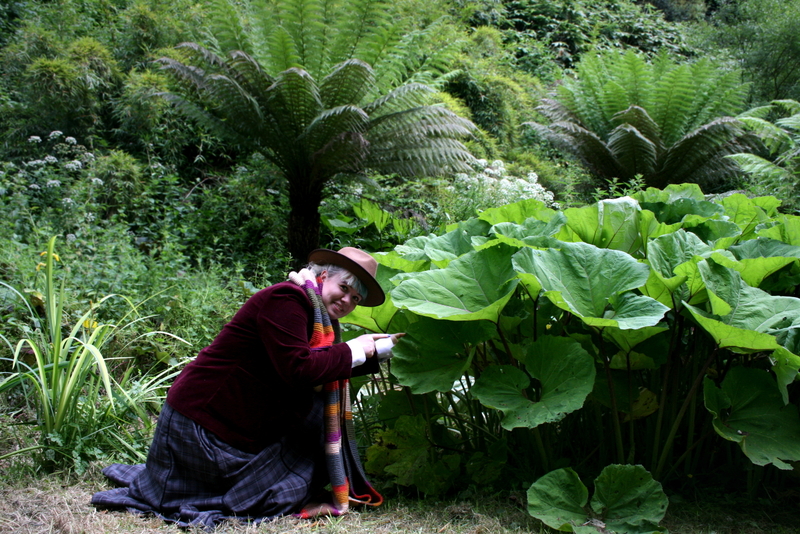 This one is from last week’s Doctor Who episode, The Doctor Falls. It was super simple to make compared to the last one! Even though I’m very happy with how my hat turned out, the pattern I’ve put at the bottom of the post is slightly different from the hat pictured here. This is because the one I made is small (it fits my head, but it might not fit yours), and I mistakenly made my hat a bit too short. I used Stylecraft Special DK in 1035 Burgundy and 1709 Gold. Pull the yarn tail through remaining stitches, pull tight, and secure ends. All that’s left is to add your pom pom on top and you’re done! 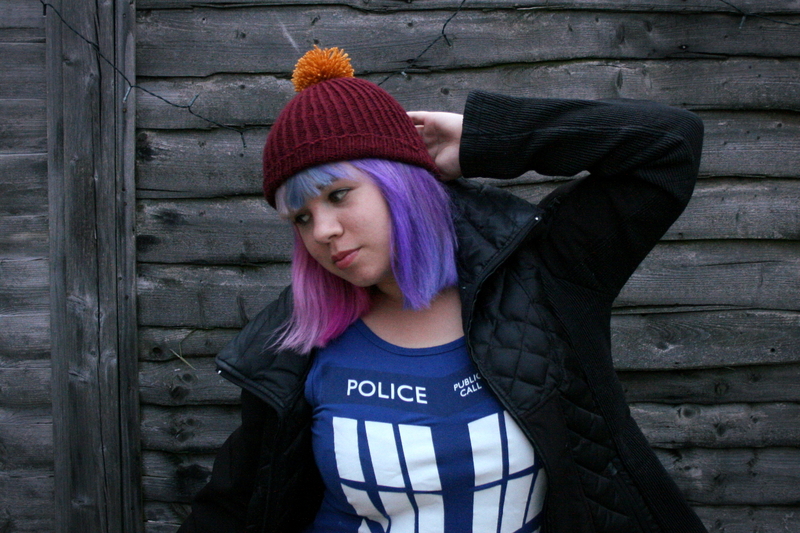 This is my version of the hat that Nardole wears in the Doctor Who episode The Eaters of Light. When this episode aired last week, I immediately knew that I needed to make his hat. It was fairly simple to make, and I’ll share my process so that anyone who wants one can make one too. This is how you wear a hat, right? 1 row in spice, 7 rows in dark brown. On the last row, pull a piece of yarn through all of the stitches. Do not gather it yet, it is easier to work in the design beforehand. The design on top is made by weaving pieces of yarn that are the same color as the single rows. 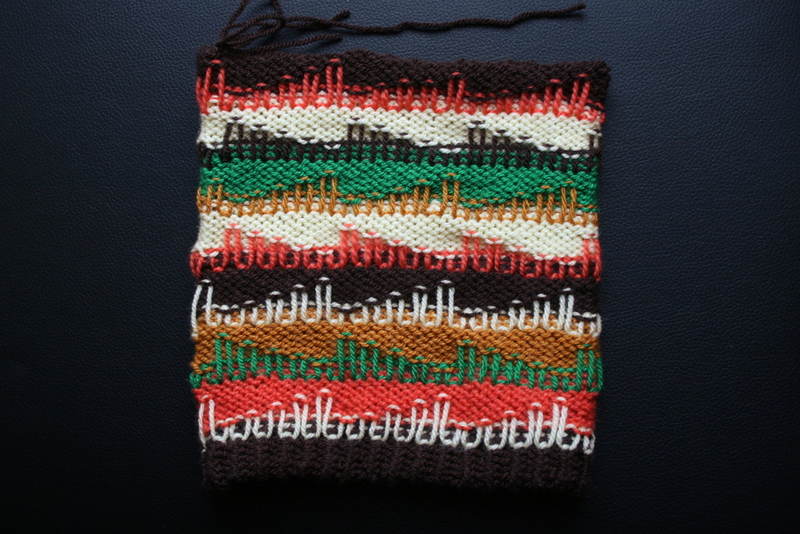 They are woven around the knit stitch below this row and brought up to the stripe above at varying heights. This is difficult for me to explain, but I hope the pictures are good enough to understand what I mean. After making the design, tighten the yarn you previously pulled through the top row of stitches and secure. 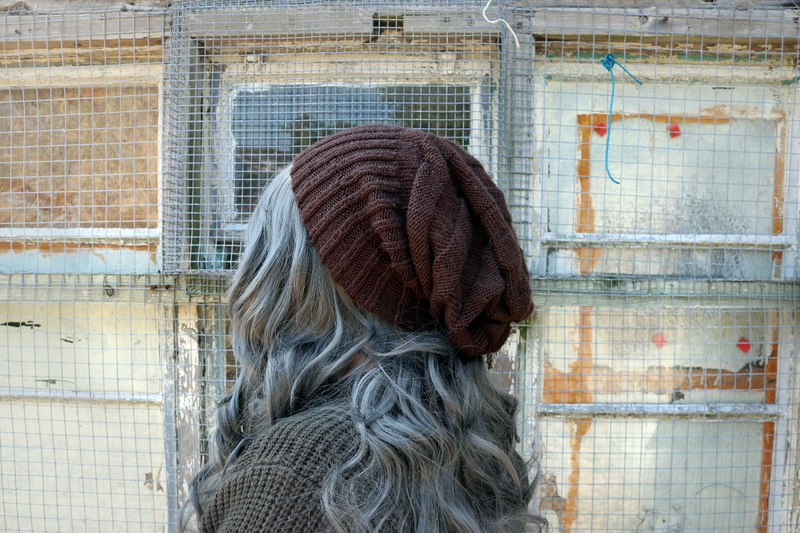 Make a large pom pom out of the dark brown yarn and attach it to the top. 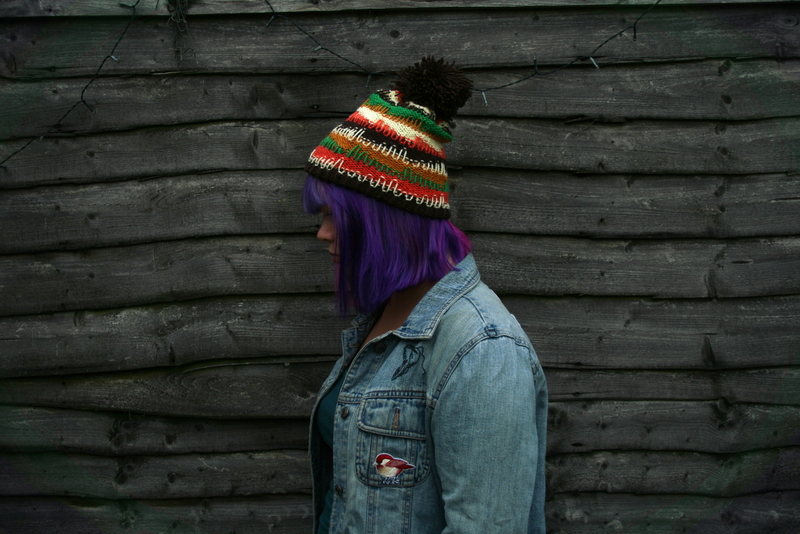 If anyone does make this hat, be sure to let me know! Since it’s summer, I doubt I’ll be wearing the hat any time soon. As soon as cold weather hits, though, I’ll be wearing it all the time! Last weekend was London MCM 2017! I went all three days and had a fantastic time. I didn’t cosplay the first day, but I wore my french fry dress and got a surprising amount of complements as well as a photo request! If I am able to track down the photo, I’ll be sure to share it here! 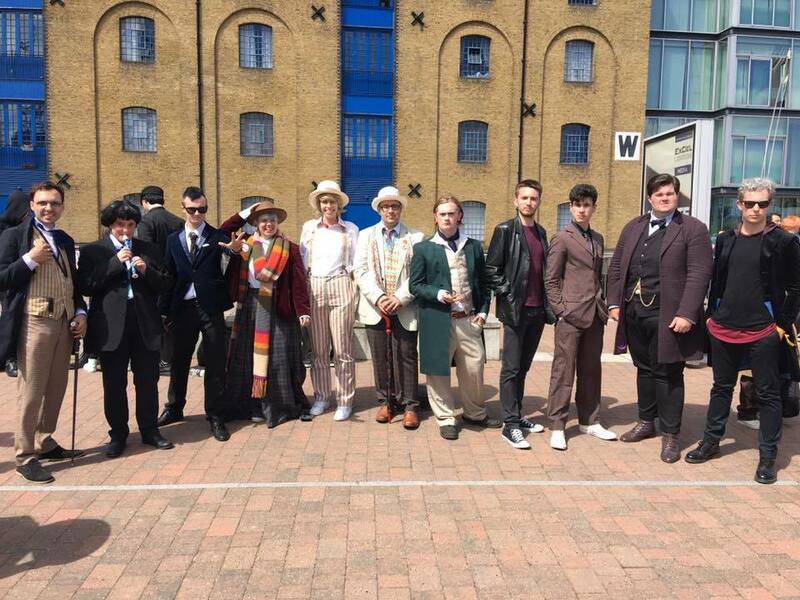 On the second day of MCM, I dressed as the fourth regeneration of the Doctor from Doctor Who. Most of the outfit is store bought, but I made both the scarf and the skirt. I knitted the scarf in fifty hours over the course of 5 months, starting on the first of January and finishing just last week on the 6th. My research for the scarf design was a combination of this site and meticulous combing through yarn websites. 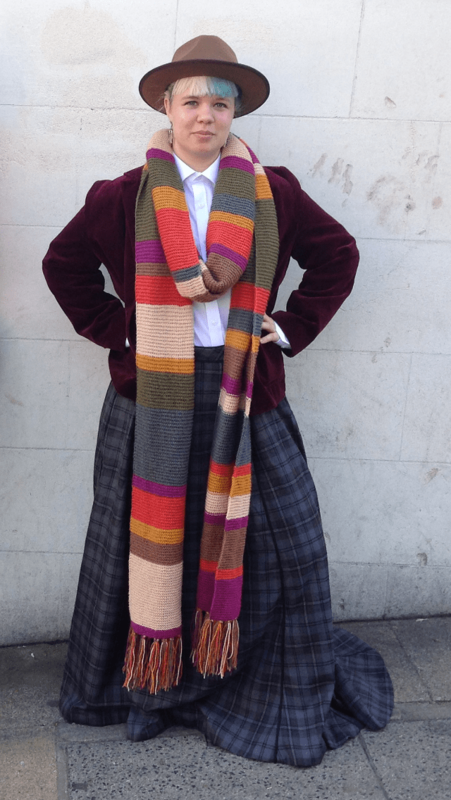 The scarf is a replica of the scarf worn by Tom Baker in the first half of season 12 of Doctor Who. I think I was able to find a very good color match with the yarn. It took a bit longer to make than I thought it would, and I made a few tiny mistakes, but I am very happy with it. I made it using US size 8 knitting needles. The skirt is actually one I made for my costume course at uni. It’s an Edwardian skirt with center back snaps and hook and eyes. I did a very good job of pattern matching each seam, which is especially evident in the back panel. The synthetic plaid fabric is backed on a black cotton, and every seam is piped with the same black cotton. 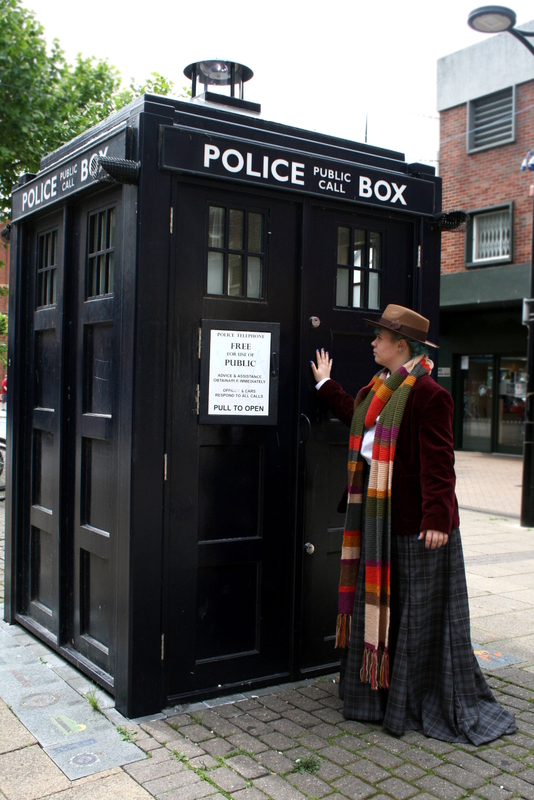 I met many lovely people at the Doctor Who meet up, but unfortunately I didn’t take many pictures. I’m not really sure who took the above photo or who some of the people are in it, so please tell me if you know! 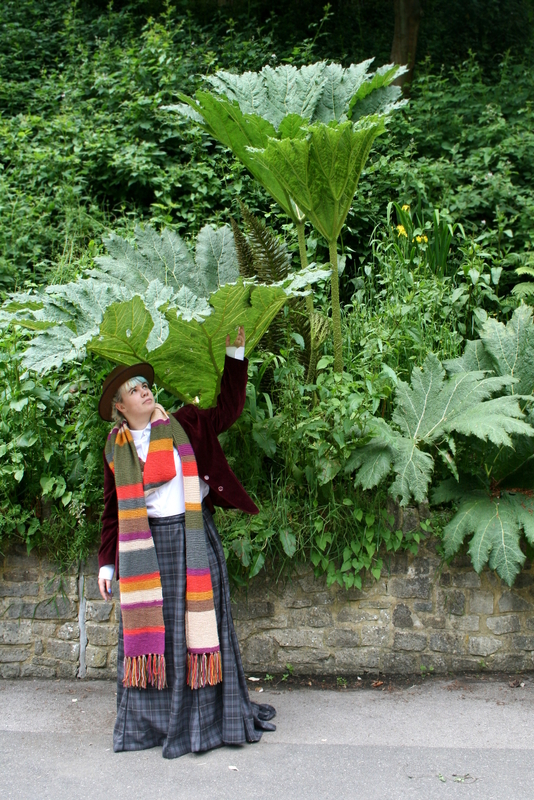 If I end up going to LFCC this year, I’ll be wearing this cosplay on one of the days. I plan on adding a waistcoat and possibly some nice shoes to the costume before then. 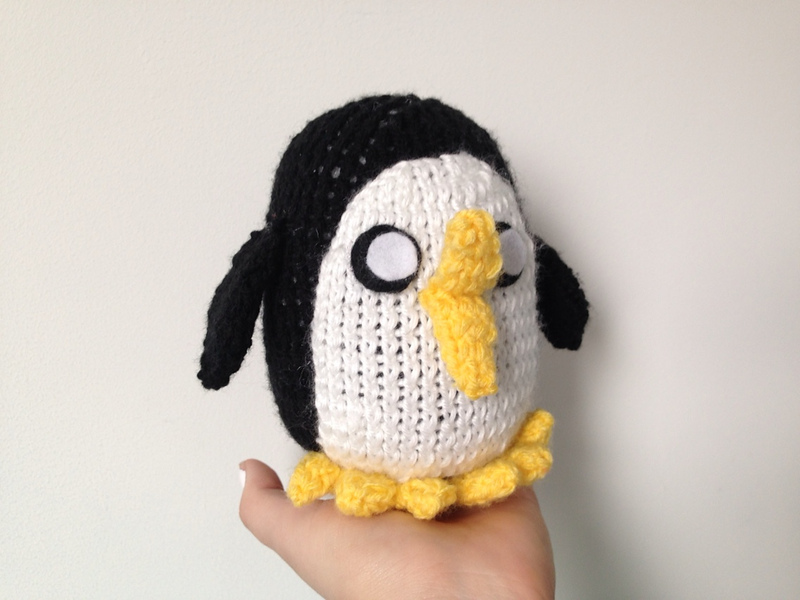 You may recognize this penguin as Gunter from the animated tv show Adventure Time. 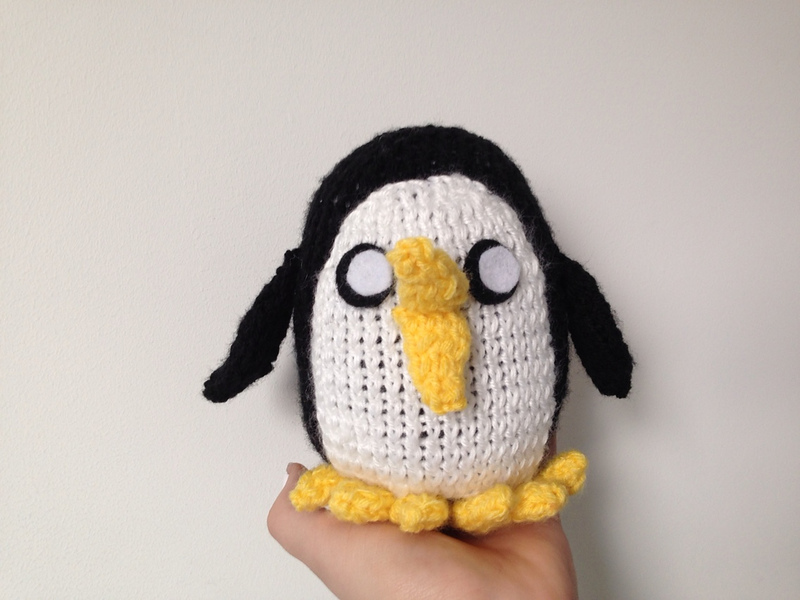 I made this tiny knitted fellow using this Adventure Time Gunter Pattern. I made him for my friend Scott‘s birthday. It was my first time knitting a stuffed animal, and it was a lot easier than I thought it would be, even though I don’t own double point needles and had to make him on regular needles. Since I worked him on normal needles, I had to sew up a lot of seams. Luckily, the seams are almost impossible to see on the finished plushy. 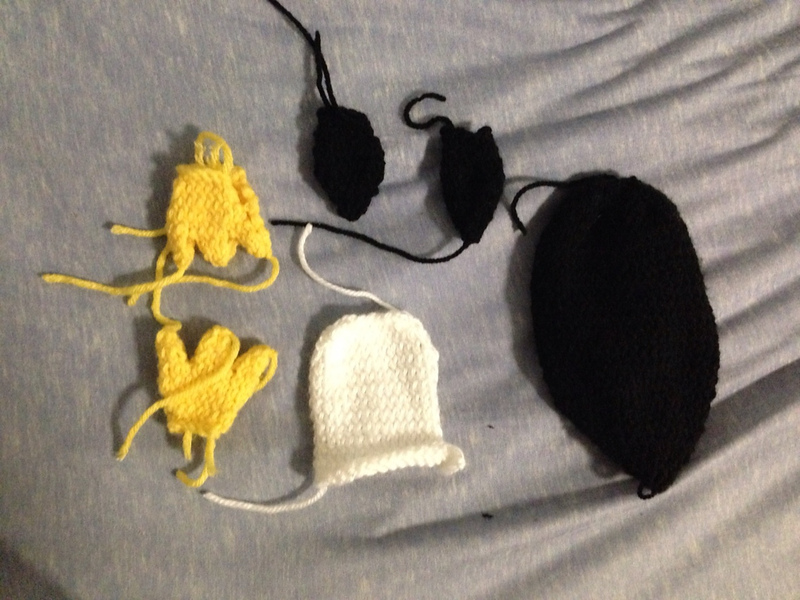 I also modified the pattern slightly when I made the feet, and added one row on each toe on accident. I think it worked out fine, and made his toes more distinguishable from each other. Over all, the pattern was surprisingly easy to knit, and I really like the result. Thanks for reading! 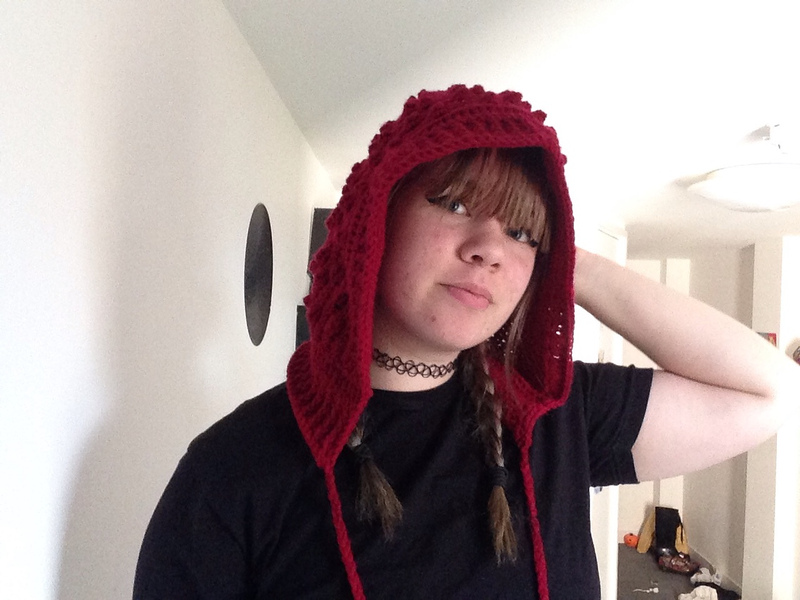 I made this hood using the Bobble Hood with Tassels pattern. It was easy and straightforward to make,but I did have a little trouble with the borders. I somehow messed up the back post single crochet so that it was on the wrong side of the piece, and had to match that when I made the second portion of the edging stitch. Looking back at the pattern, my hood appears to be a bit smaller than the original, and the bobbles are in slightly different places. I’m not entirely sure what I did to cause this. 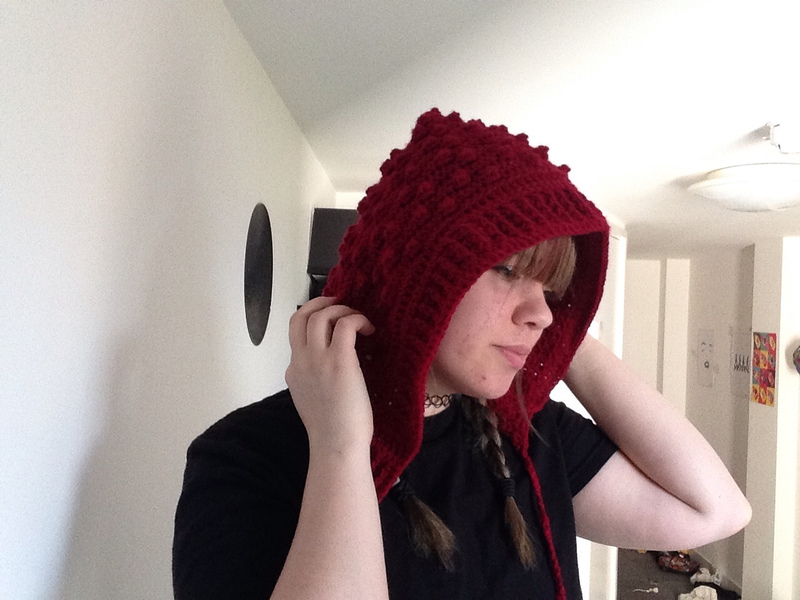 I am happy with the hood I ended up with, but I’m not sure it was the one that I was trying to make. I’ve received a lot of compliments on it, and might make another one. Next time I’ll pay closer attention to the pattern to figure out what I did wrong. 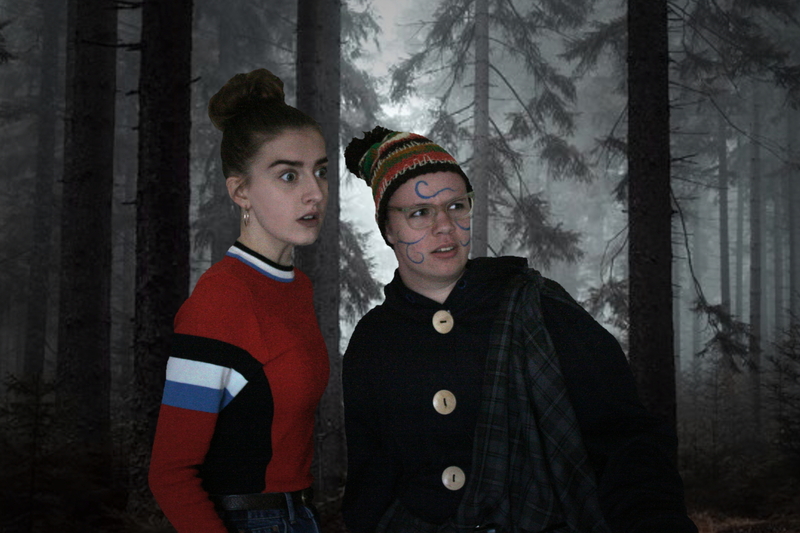 My name is Evelyn Stowe and I graduated with a costume degree from Arts University Bournemouth in 2018. I specialize and have experience in knitwear, crochet, and garment construction.